We have registered and skilled nurses that will provide home health care nursing needs. The home environment can make you heal and recover faster which is why we encourage independence and purposefulness. 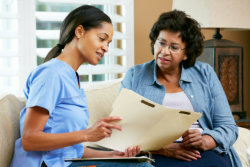 When providing Long Term Care in Aurora, Colorado, our nurses provide the highest level of technical expertise, competence, and compassion to ensure effective and quick recuperation. Nursing visit services are ideal for those of you who have been recently discharged from the hospital but still require close monitoring by skilled healthcare professionals to assist you as you get back to your daily routine. Our registered nurses are more than capable of handling these plus other complex services in Skilled Nursing. To know more about our nursing visit services, do not hesitate to contact us at 1-720-370-6772.